Home Campaigns Child Prisoners Free Ahed Tamimi! UPDATE (13 February): The first preliminary hearing in Ahed’s military trial took place today, 13 February. Over Ahed’s lawyers’ objections, the military court was closed to journalists and a closed trial ordered, while the defense argued to drop the case entirely due to the illegitimacy of Israeli military courts. The next hearing in the case will convene on 11 March, and global protests are taking place on 18 February. UPDATE (18 January): Join the call to action! 26-30 January are days of global protest to free Ahed Tamimi and her fellow Palestinian prisoners. Ahed will turn 17 on 31 January, the day of her next military court hearing. On 17 January, Ahed was ordered jailed through her military trial. Organize to demand her freedom! 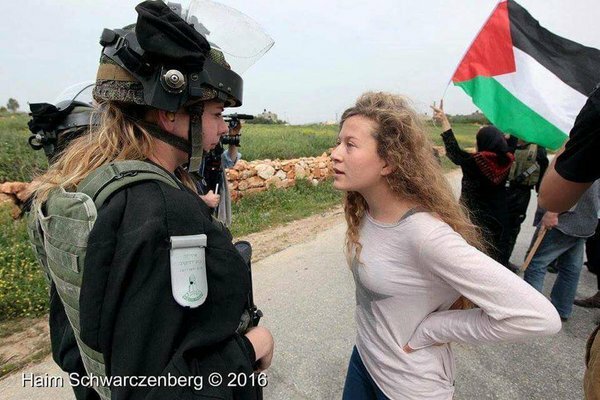 UPDATE (15 January): Ahed and Nariman Tamimi’s detention was extended until Wednesday, 17 January by the Ofer military court; a ruling on whether they will be detained through their military trial is expected on that day. Protests are taking place in Copenhagen, New York, Montevideo, Berlin, Paris, Marseille, Nimes, Lyon and elsewhere to demand freedom for Ahed and her fellow Palestinian prisoners. UPDATE (12 January): Ahed and Nariman Tamimi will be brought back before a military court on 15 January. Ahed’s 19-year-old cousin, Mohammed, was seized from the home of Manal and Bilal Tamimi, his parents, in the early morning hours of 11 January by invading occupation soldiers. There are protests and actions taking place around the world to support Ahed, her family and Palestinian prisoners. UPDATE (1 January): Ahed and Nariman Tamimi were charged by an Israeli military occupation court today, as was Nour Tamimi. Ahed and Nariman’s detention was extended for eight days, while Nour was ordered released pending an appeal by the military prosecution. Manal Tamimi was also ordered released pending appeal by the military prosecution. 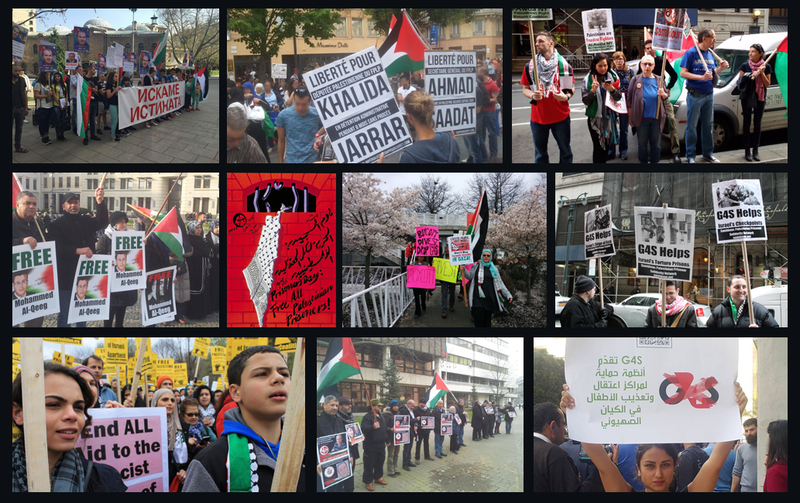 Protests are being organized in Los Angeles, New York, Manchester and elsewhere to demand freedom for Ahed and fellow Palestinian prisoners. UPDATE (25 December): Israeli occupation Ofer military court extended the detention of Ahed, Nour and Nariman Tamimi for four days, on a morning following night raids in their village of Nabi Saleh, where two Palestinian youth, Izz and Moatasem Tamimi, were seized by occupation soldiers. UPDATE (21 December): Nariman and Nour Tamimi‘s detention was extended by an Israeli military court this morning to Monday. People around the world are organizing a global call to action to #FreeAhedTamimi, with protests on 22 December and more. To sign on to the call or download materials, please click here. FURTHER UPDATE: Bassem Tamimi was detained and released by Israeli occupation forces today, 20 December, as he attended the hearing for his daughter Ahed in Ofer military court, which extended her detention until Monday at the earliest. In overnight, violent raids, occupation forces seized a cousin of the family and a fellow prominent activist Nour Tamimi, 21, from her family home in Nabi Saleh. This means that Ahed and both of her parents, Nariman and Bassem – all of whom are leading land defenders in Nabi Saleh – are currently seized by the Israeli occupation forces. UPDATE: Nariman Tamimi, Ahed’s mother, has also been arrested by Israeli occupation forces as she went to the Benjamin occupation police station to support her daughter, reported Bassem Tamimi on Facebook. We are updating our alert below and urge people to join the call to free Ahed and Nariman! Ahed Tamimi, 16 years old and a prominent activist in the occupied Palestinian village of Nabi Saleh, whose courage along with that of her family in standing up to armed Israeli soldiers, land confiscation and settlement construction stealing the resources and even the well of their village has become world-renowned, was seized by occupation soldiers who invaded the Tamimi family home on the morning of 19 December 2017. Ahed’s father, Bassem, posted on Facebook that Ahed was targeted for arrest after she was attacked by Israeli media after she protested occupation soldiers in Nabi Saleh who shot a 14-year-old boy in the head with a rubber-coated metal bullet; the boy, Mohammed Tamimi, is in a medically-induced coma. Tamimi reported that the soldiers violently invaded the home, hitting Ahed’s mother, Nariman Tamimi, and siblings, and confiscating phones, cameras, laptop and other electronics. Ahed was taken away by the occupation soldiers to an unknown location. 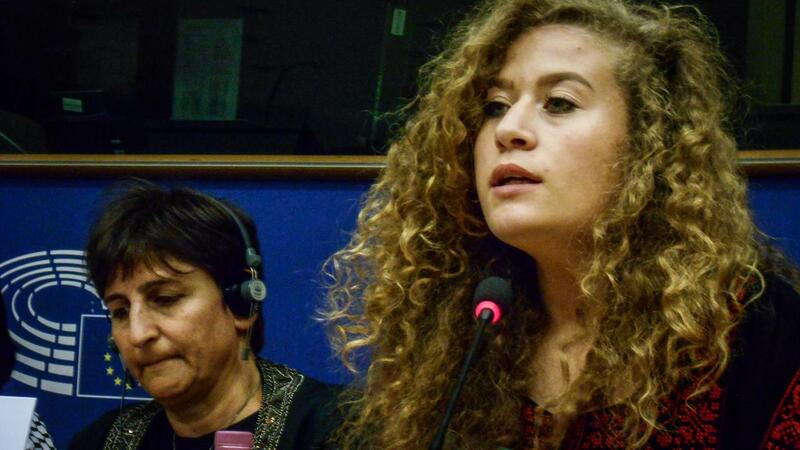 Ahed has become internationally known for her defense of Palestinian rights under occupation, including her defense of her younger brother when he was seized by an occupation soldier and regular protests against land confiscation targeting Nabi Saleh and other villages around Ramallah. She has spoken internationally, including in Turkey, South Africa, and in the European Parliament in a conference earlier this year on women in Palestinian resistance, where she spoke alongside Leila Khaled, Sahar Francis and several members of parliament. Ahed’s visa to the United States in early 2017 was put under “administrative review,” when she was to participate in a tour across the U.S. with writer and activist Nadya Tannous and Black liberation activist and minister Amanda Weatherspoon on Palestinian-Black solidarity and joint struggle. The lengthy delay and effective visa denial meant that Ahed was unable to join the tour live. Samidoun Palestinian Prisoner Solidarity Network denounces the arrest of Ahed Tamimi and Nariman Tamimi, the latest of over 450 Palestinians arrested by Israeli occupation forces following U.S. President Donald Trump’s declaration of recognition of Jerusalem as the capital of Israel. Issa Qaraqe of the Palestinian Prisoners Affairs Commission stated that approximately half of those detained, like Ahed, Abdul-Khalik Burnat and Fawzi al-Junaidi, are children. There are hundreds of Palestinian children jailed by Israel and frequently subject to beatings, abuse, and interrogations without parents or lawyers present in violation of the law. 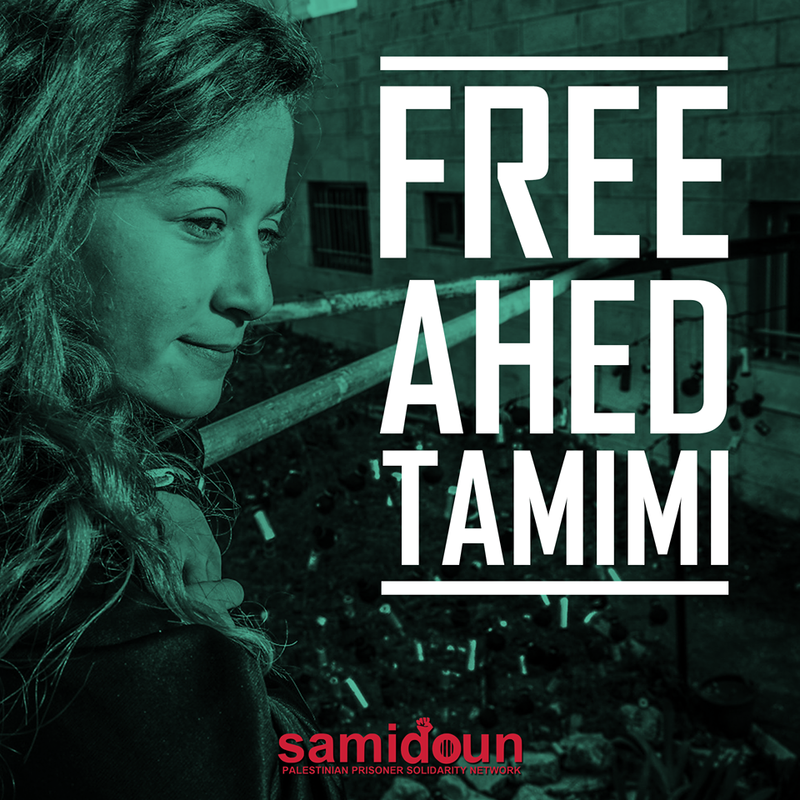 We urge people of conscience around the world to take action to demand freedom for Ahed and her fellow detained and jailed Palestinian children in occupation detention centers, interrogation centers and prisons – and for Nariman Tamimi and all detained and imprisoned Palestinians. The resistance of the Palestinian people has never been quelled by arrests or repression, and it must be clear that we, around the world, stand alongside the Palestinian people as they defend Jerusalem and their entire land and people under attack. This includes standing with detained and jailed Palestinian prisoners in their struggle for liberation for themselves, their people, and their occupied homeland. TAKE ACTION *UPDATED 12 JANUARY*: . For supporters in the US: Call your member of the House of Representatives to support H.R. 4391, the Promoting Human Rights by Ending Israeli Military Detention of Palestinian Children Act. Tell them specifically about Ahed’s arrest, and urge them to act for her release. Tell them to pressure Israel to free Ahed and other detained Palestinian kids. Call the House switchboard at (202) 224-3121 and ask to speak to your Representative’s office. CODEPINK has an action to highlight this case specifically. Join the international actions: Write to your national parliamentarians and officials and urge them to take a stand for Ahed Tamimi. Sample letters and actions here. Organize a protest for Ahed or join one of the many protests for Jerusalem and distribute this post and other news about Ahed and the Palestinian prisoners. Get others involved in the struggle for Palestinian freedom! 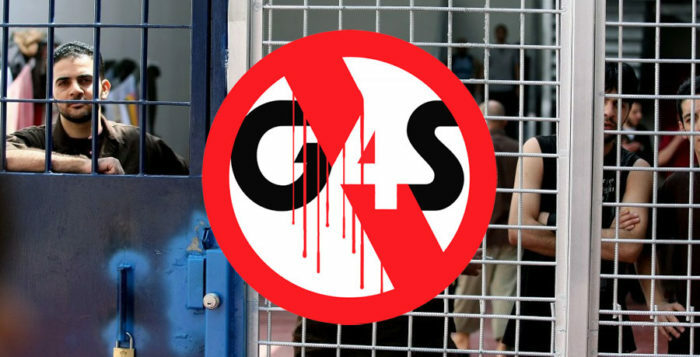 Build the campaign for boycott, divestment and sanctions against Israel and complicit corporations like HP and G4S.